- Your bad things turn out for good, your good things can never be lost, and the best things are yet to come. - Christ meets us in our worst trials. - In the midst of our loss, God is still at work, and his ultimate aim is to bless. - God meets us in the whole range of our human experience. 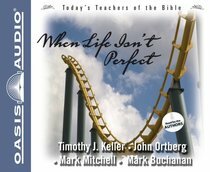 About "When Life Isn't Perfect (#2 in Today's Teachers Of The Bible Series)"
Timothy Keller is the founding pastor of Redeemer Presbyterian Church in Manhattan, which he started in 1989 with his wife, Kathy. For over twenty-five years he has led a diverse congregation of young professionals that has grown to a weekly attendance of over 5,000. He is also Chairman of Redeemer City to City, which starts new churches in New York and other global cities, and publishes books and resources for faith in an urban culture. In ten years they helped to launch over 250 churches in 48 cities. More recently, Dr. Keller's books - including the New York Times bestselling The Reason for God, The Prodigal God, and Prayer: Experiencing Awe and Intimacy with God - have sold over 1 million copies and been translated into 15 languages. Tim was born in 1950, raised in Pennsylvania, and educated at Bucknell University, Gordon-Conwell Theological Seminary, and Westminster Theological Seminary. He previously served as the pastor of West Hopewell Presbyterian Church in Hopewell, Virginia, Associate Professor of Practical Theology at Westminster Theological Seminary, and Director of Mercy Ministries for the Presbyterian Church in America. Tim and his wife Kathy have three adult sons.